A biome is an ecological community of plants and animals, soil and water and air, living together in a particular climatic zone. There are six land biomes: arctic tundra, taiga, temperate deciduous forest, tropical rain forest, tropical savannah, and desert. Each biome has specific climatic conditions - temperature, precipitation amounts, soil conditions, vegetation, and animals. As people live in these different places, they build shelter and communities in different ways to respond to different climatic and topographic living conditions. There are also three water biomes: eitherarctic, freshwater and saltwater. Scientists study biomes to better understand changing climate, freshwater needs, endangered species. How people interface with climate, wildlife, and vegetation of a specific place balances or imbalances nature. Disappearing rain forests and global warming in the polar ice caps are two current biome concerns. Find out the latitude and longitude of your neighborhood and city. Plot your location on a map. Next look at the link to the world biome map and find the biome that you live in. Do you have seasons? What is the annual temperature range and precipitation? What plants and animals are native to your area? What are homes like? Do the homes in your area reflect a natural response to your biome? Make a picture chart of your biome which shows your house in the four seasons with temperature ranges and amounts of precipitation. 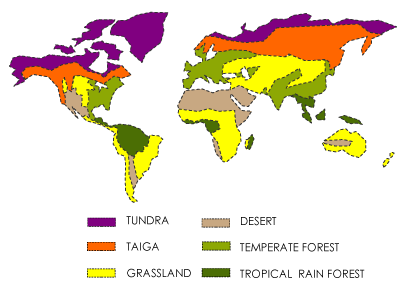 Research biomes of the world. 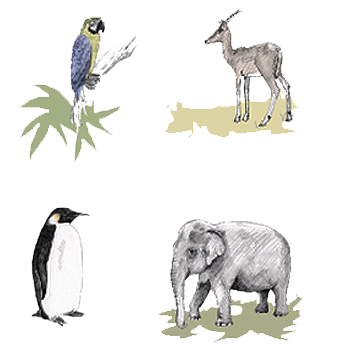 Match these Biome Flashcards. Open the World Biome map. Copy the map and label the biomes. Then draw a view of each biome. Include landforms, geography and topography features, key vegetation and plants, and at least three animals. Label your Biome pictures and include them in your journal. Activity 3 – Ring Around the World! Print a World Map using the link. Draw the equator at zero degrees latitude. The equator is almost 25,000 miles around (24,901.55 miles or 40,075.16 kilometers). Show the sun directly overhead at noon above the equator on the two equinoxes - near March 21 and September 21 at the equator. Label the top half of the earth the Northern Hemisphere and the bottom half the Southern Hemisphere. Next, draw the Tropic of Cancer at 23.5° North of the equator and the Tropic of Capricorn at 23.5° South of the equator. This area is known as the ‘tropics’ because the sun is always high in the sky. North of the Tropic of Cancer and south of the Tropic of Capricorn, biomes have seasons. Lastly, locate the Prime Meridian and divide the earth into the Eastern and Western hemispheres. Be a world traveler. Ring the World! A biome is a region. There are six biomes on earth. There are three water biomes. The definition of a biome includes climate, vegetation and wildlife. 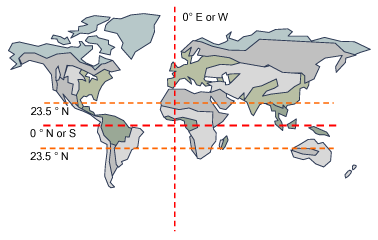 Longitude lines run parallel to the equator. Why Files Critters Are everywhere!